S M Ong: I am (was?) one of The Middle Ground's 215 patrons: Can I still get my umbrella? I am (was?) one of The Middle Ground's 215 patrons: Can I still get my umbrella? When The Middle Ground announced that it was calling it quits, I was taken aback. Was it my fault? If only I had attended its event last night. But I had to work. I have been a "patron" of TMG since January after it launched its Patreon fundraising campaign. 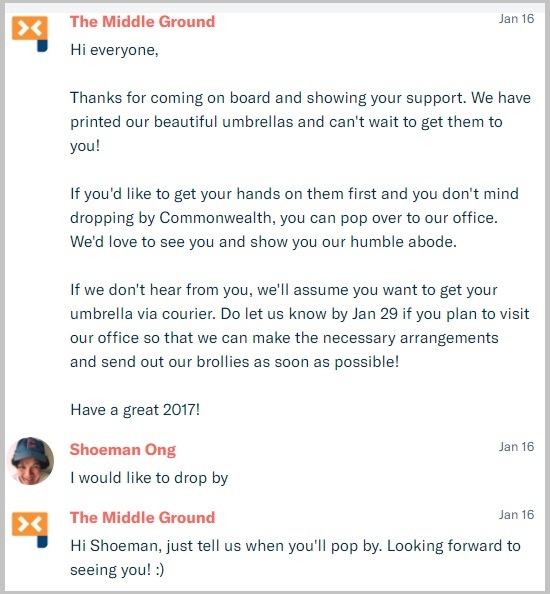 I could have just pledged US$10 per month to get the umbrella. But I didn't want to appear to be supporting TMG just for the umbrella, so I leveled up to US$25 per month instead. We will write your name on our office wall and let everyone know that we've got you to thank for what we are able to do! What else can we offer? Drop us a line and swing by our office any time - coffee's on us, and we'll let you in on what we're up to. I could have had the umbrella sent to me, but I opted to pick it up myself because I wanted to see what The Middle Ground office looks like and look for my name on the wall. 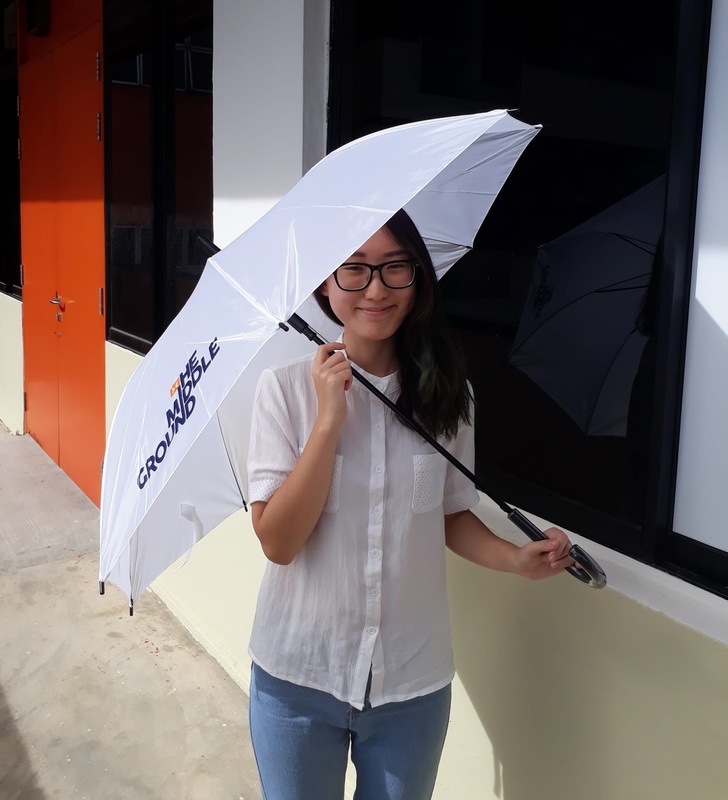 But the office is in some out-of-the-way place at Commonwealth Drive (near my old secondary school, New Town), so I never got around to picking up my umbrella. Then two weeks ago, I received an invitation to "an exclusive backers-only event". I figured I could go and get my umbrella at the same time, but suay suay, the event was last night when I had to work. So I missed the event and now TMG is shutting down. We have just over 200 patrons on the platform, contributing about $3,000 each month, and the choices we made meant that we were not as attractive as other platforms when it came to sheer traffic and viral content – the lifeblood of ad campaigns. Unfortunately, the overheads for a solid news editorial team run into the tens of thousands, and TMG wasn’t an operation we could sustain long term, not without departing from the core values that we hold dear. So it seems times are tough for journalistic enterprises both big (like SPH and Today) and small (like TMG). This process of winding down TMG will take between one and three months, because of some of the obligations we have to our clients and suppliers. These will have to be negotiated, but we commit to publishing what we can while we fulfil our obligations. 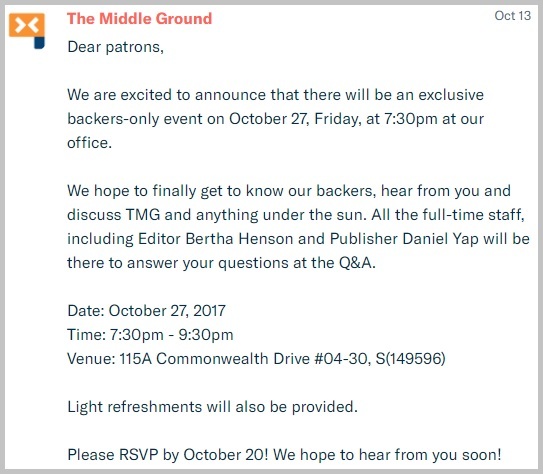 We will cancel our TMG Patreon campaign effective Nov 15, 2017. So I'll have US$25 more to spend on shoes after next month. The Middle Ground is, of course, the second successive website editor Bertha Henson is shutting down after The Breakfast Network in 2013. I guess she still has her blog, Bertha Harian, which was always more interesting anyway. But I still don't have my umbrella.